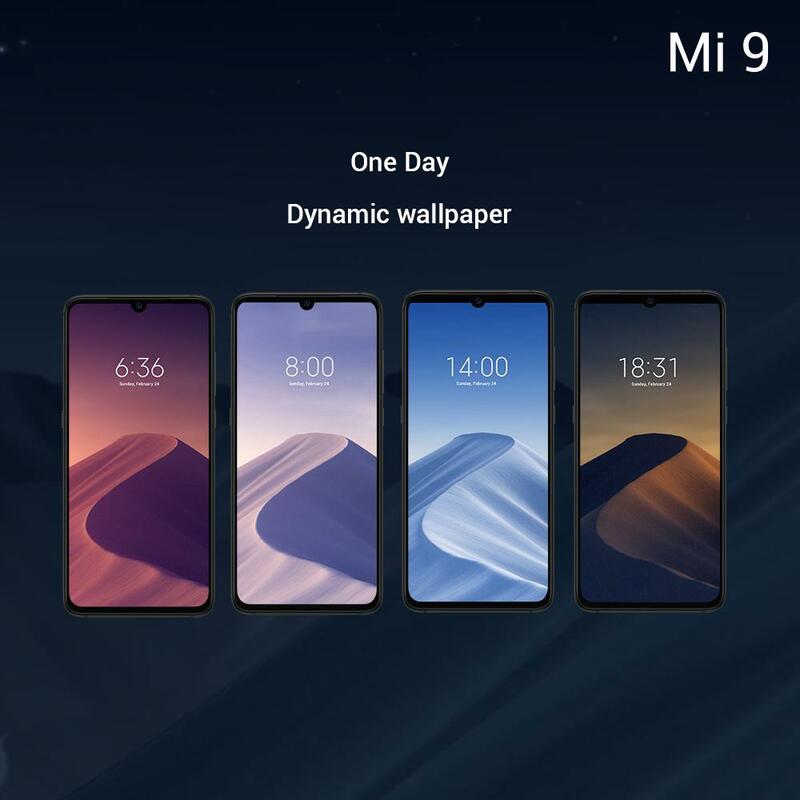 After revealing pretty much every bit of information about the smartphone on social media, Xiaomi has officially announced the Mi 9 and Mi 9 Transparent Edition at a launch event in China. While Xiaomi’s Redmi sub-brand focuses on budget and mid-range smartphones, their Mi and Mi Mix smartphones are all high-end flagship devices. 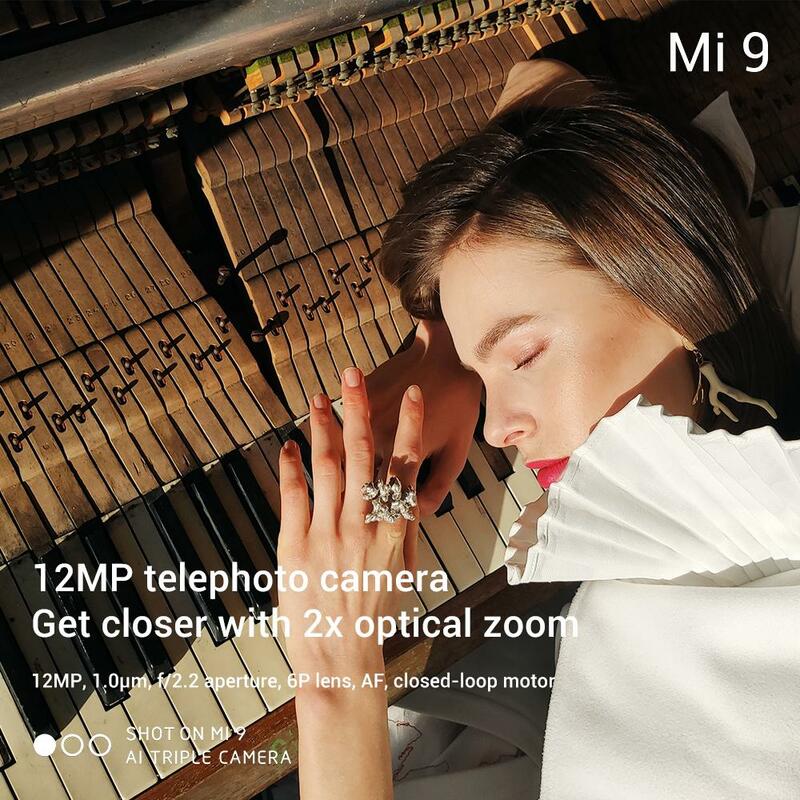 We’ve known the Mi Mix series for carrying Xiaomi’s premium design language, but Xiaomi has to contend with an incredibly competitive smartphone field at the beginning of 2019 so they’re going all-in with the new Xiaomi Mi 9. 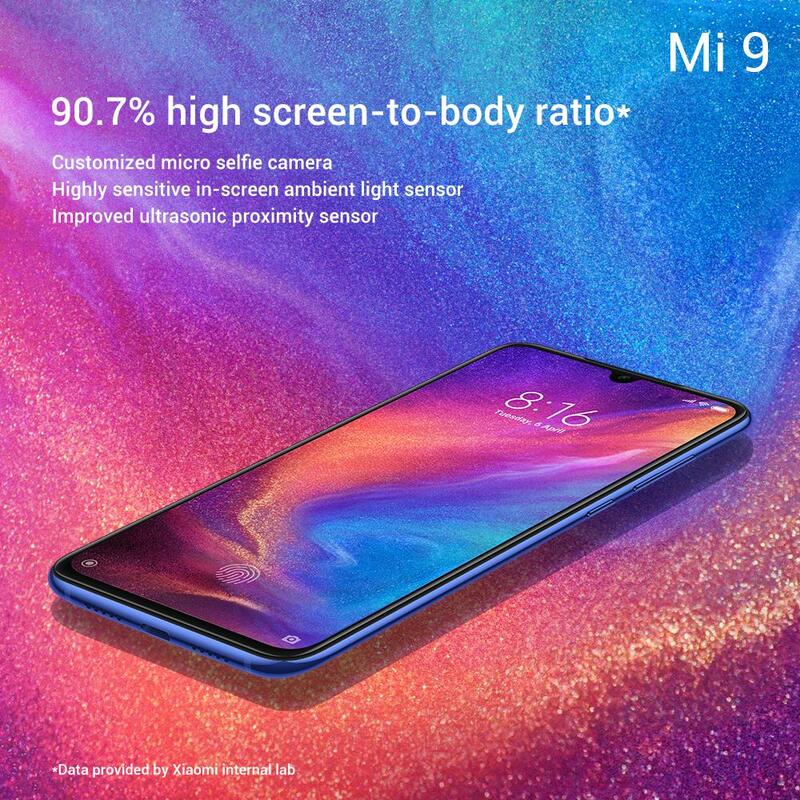 The Xiaomi Mi 9 has the latest Qualcomm Snapdragon 855 mobile platform, a fifth-generation optical in-display fingerprint sensor, a gradient back with a holographic effect, nearly bezel-less design with a waterdrop notch, a triple rear camera setup including a 48MP sensor, telephoto lens, and wide-angle lens, and up to 12GB RAM in the special Transparent Edition model. Xiaomi is stealing some of Samsung’s thunder with a launch event on the same day as Samsung Unpacked, but is the Xiaomi Mi 9 a worthy contender to the Samsung Galaxy S10? We’ll give you the rundown on the Mi 9’s specifications and features to help you decide. Update 2/20/19 @ 01:05PM ET: Check out our initial impressions of the Xiaomi Mi 9, courtesy of our sister site PocketNow. Xiaomi is no stranger to gradient color designs, having notably launched the Mi 8 Pro and Mi Play in Twilight Gold. 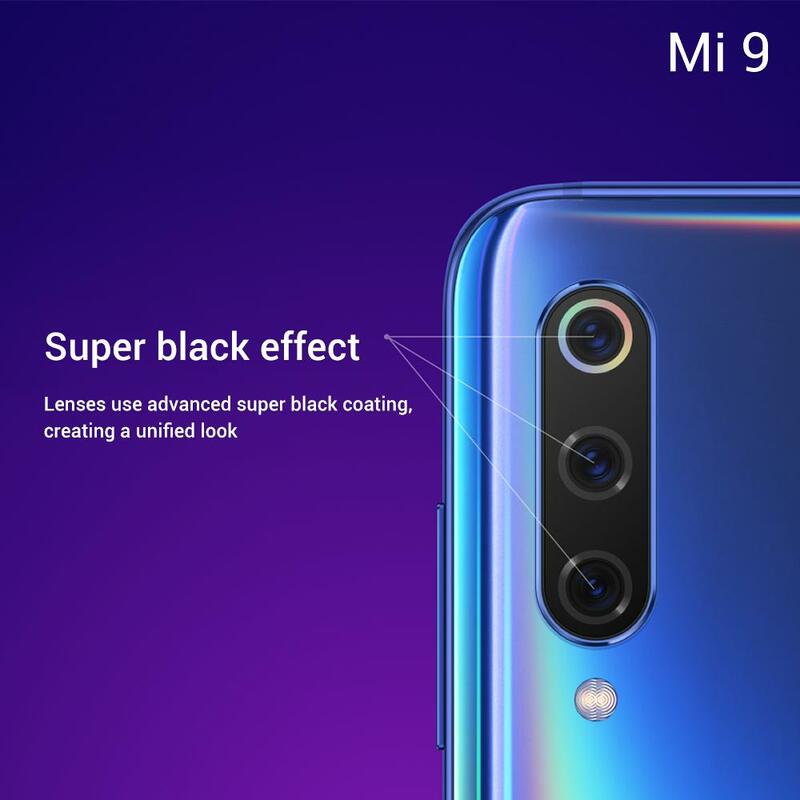 The Xiaomi Mi 9 will also have a gradient color design in the Lavender Violet and Ocean Blue models when viewed at the right angles. That’s thanks to the devices having a “holographic” effect on the back which Xiaomi says is made using nano-level laser engraving and dual-layer nano-coating. 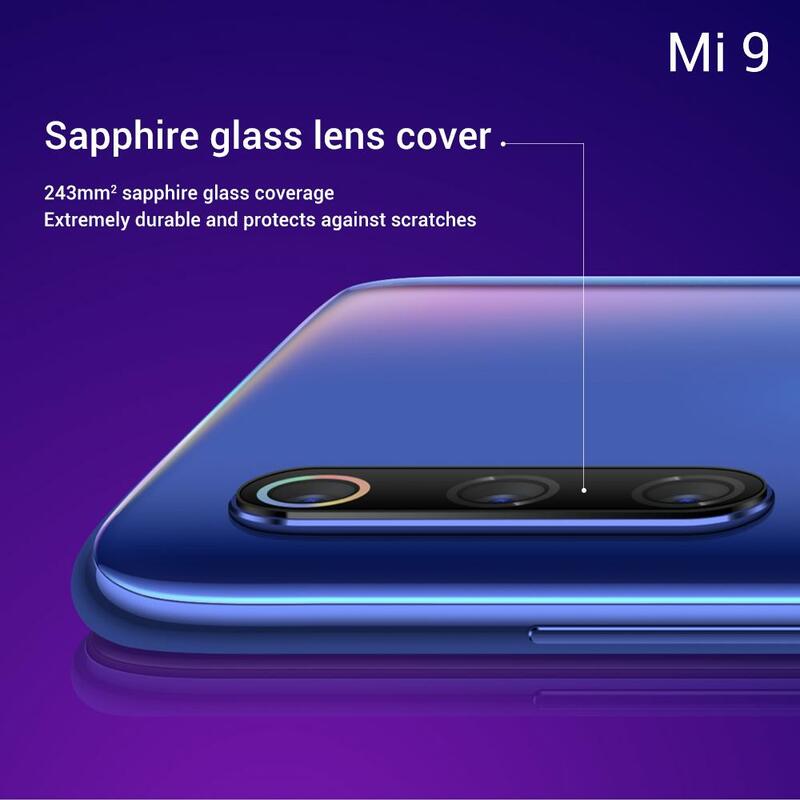 As seen in the feature image, the Mi 9 has a colorful shimmer at different angles. In the image shown below to the left, you’ll see the Piano Black model which has a more subtle design but shows a curved S shape when it reflects light at the right angle. We’ll be able to give you a better idea of what the device looks like in-person once we get out hands on one. 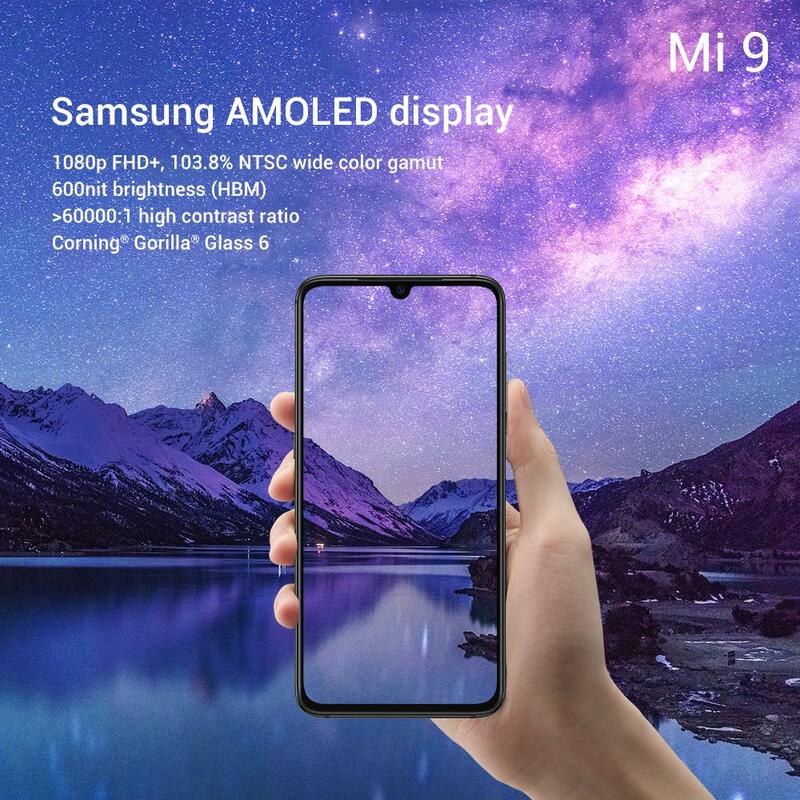 On the front, the Xiaomi Mi 9 has a 6.39-inch Samsung AMOLED display with a 90.7% screen-to-body ratio thanks to its waterdrop notch cutting off some of the top bezel, a 40% reduction in the chin size when compared to the Mi 8, an in-screen ambient light sensor, and an ultrasonic proximity sensor like on the Xiaomi Mi Mix 3. The resolution is Full-HD+ (1080p) and reaches 600-nit brightness levels with support for High Brightness Mode (HBM). 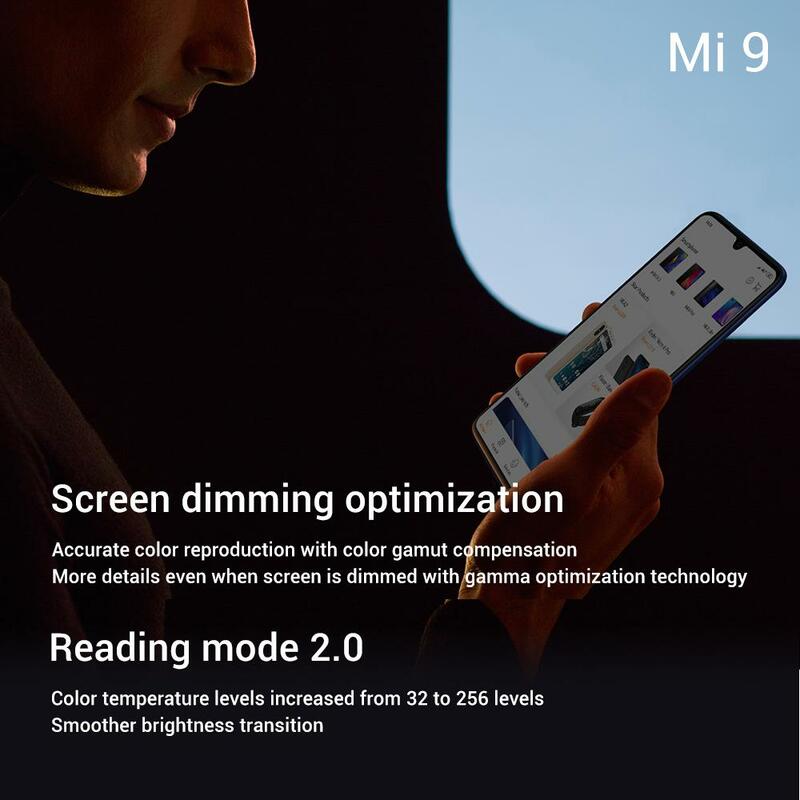 Xiaomi says the device has a new Sunlight Mode 2.0 which optimizes the contrast and colors for outdoor reading, and a new Reading Mode 2.0 to optimize the color temperature and brightness transitions when reading content. 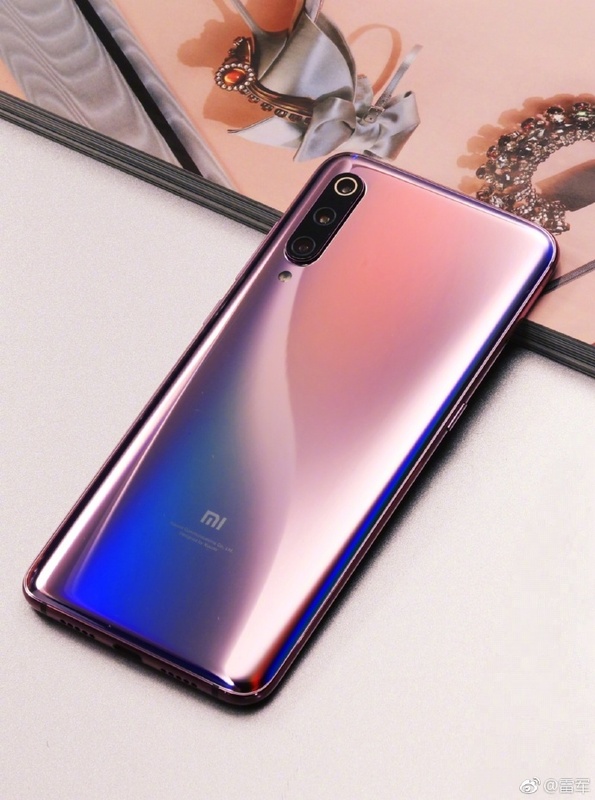 The Xiaomi Mi 9 has a stainless steel frame and 243 sq. millimeters of sapphire glass covering the rear camera lenses. For glass protection, the device has a layer of Gorilla Glass 6. 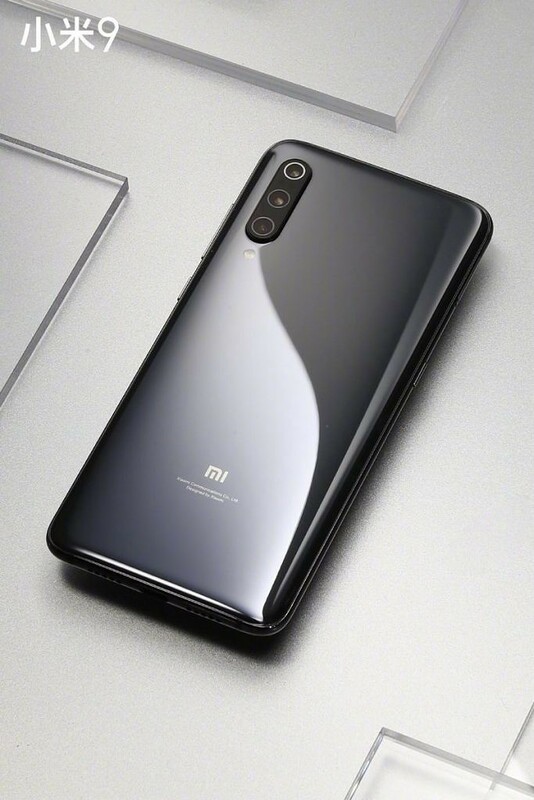 There’s a decorative halo around the rear lens which Xiaomi calls the “super black effect.” Lastly, the device has a fifth-generation optical in-display fingerprint scanner which Xiaomi says is 25% faster than the fourth-generation sensor found in the Xiaomi Mi 8 Pro or Xiaomi Mi 8 Explorer Edition. The device is 7.61mm thick excluding the camera bump and it weighs 173g. 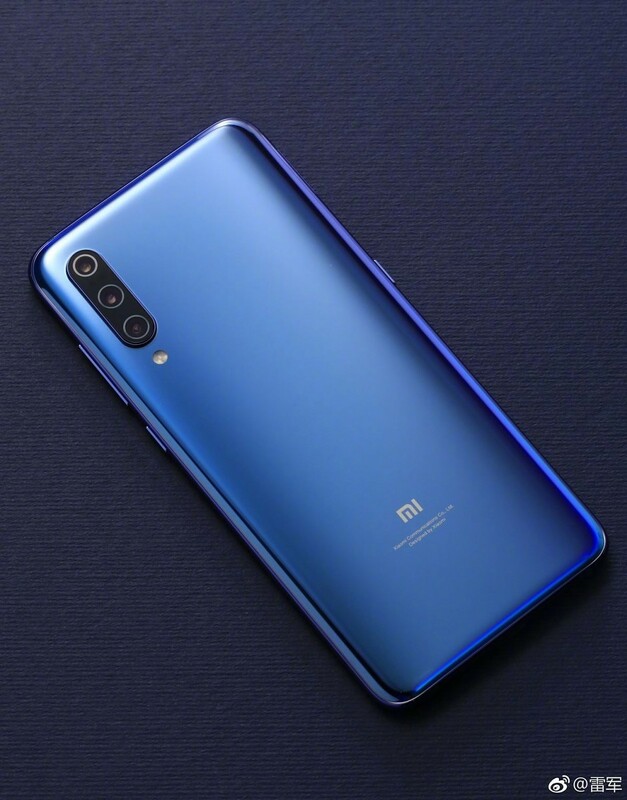 The Xiaomi Mi 9 is powered by the 7nm Qualcomm Snapdragon 855 mobile platform, which includes Qualcomm’s latest Adreno 640 GPU. The Snapdragon 855 is comprised of 1 A76-based Kryo 485 clocked at up to 2.84GHz, 3 A76-based Kryo 485 cores clocked at up to 2.42GHz, and 4 A55-based Kryo 385 cores clocked at up to 1.8GHz. 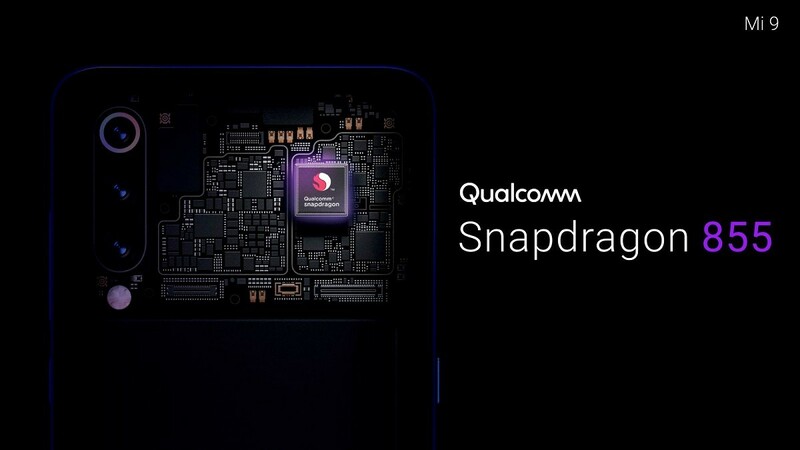 We’ve extensively documented the improvements that Qualcomm made in the Snapdragon 855 as well as benchmarked the new mobile platform against the Qualcomm Snapdragon 845 and HiSilicon Kirin 980, so you should refer to those articles for more details on the Snapdragon 855. 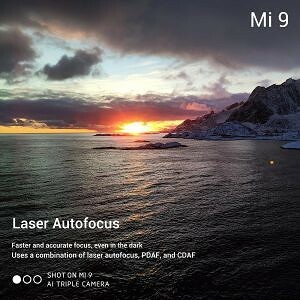 In the Mi 9, Xiaomi is packing all the camera sensors that are actually useful, and not gimmicky. 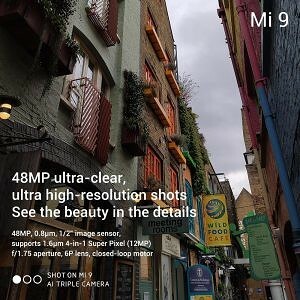 There’s a Sony IMX586 48MP sensor, a telephoto lens for portrait shots, and an ultra wide-angle lens with Xiaomi’s anti-distortion algorithm. We’ve already seen what the IMX586 is capable of in the Honor View 20, so we’re expecting great things from the Mi 9. 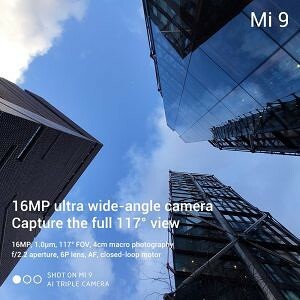 I’ve recently become a strong believer in ultra wide-angle lenses, so I’m happy that Xiaomi opted to include one rather than a ToF sensor. 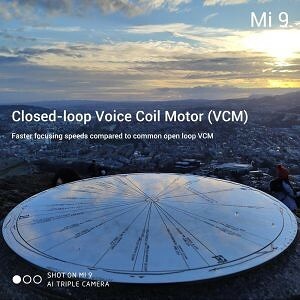 The device supports 960FPS super slow motion video recording like the Mi Mix 3, but it’s unclear if this is still accomplished via interpolation. 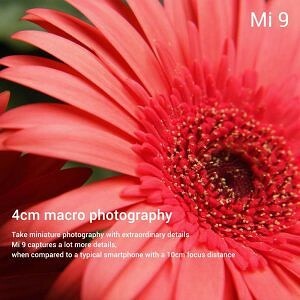 Xiaomi is also advertising improved image stabilization on the Mi 9. Super Night Scene mode will also be present on the device for low-light photography, while AI scene recognition will optimize the camera mode for the current scenario. The Mi 9 has a 20MP front-facing camera. Xiaomi doesn’t seem to be putting much emphasis into this sensor, though the company notes that the Mi 9 supports all of MIUI‘s AI beauty mode functions. I’m sure it’ll take decent selfies, but it might not be on par with the Google Pixel 3 or Samsung Galaxy Note 9. The Xiaomi Mi 9 performs excellently in DxOMark’s testing of the picture-taking and video-recording experience, for what it’s worth. The Xiaomi Mi 9 is powered by a 3,300mAh battery, but like the Mi Mix 2S, it supports wireless charging. Xiaomi says the Mi 9’s wireless charging supports up to 20W via a proprietary charger, and 10W via Qi wireless charging. The device can be charged with the included charger at up to 27W as well. Xiaomi is offering multiple charging accessories along with the Mi 9, which we’ve detailed in the chart below. 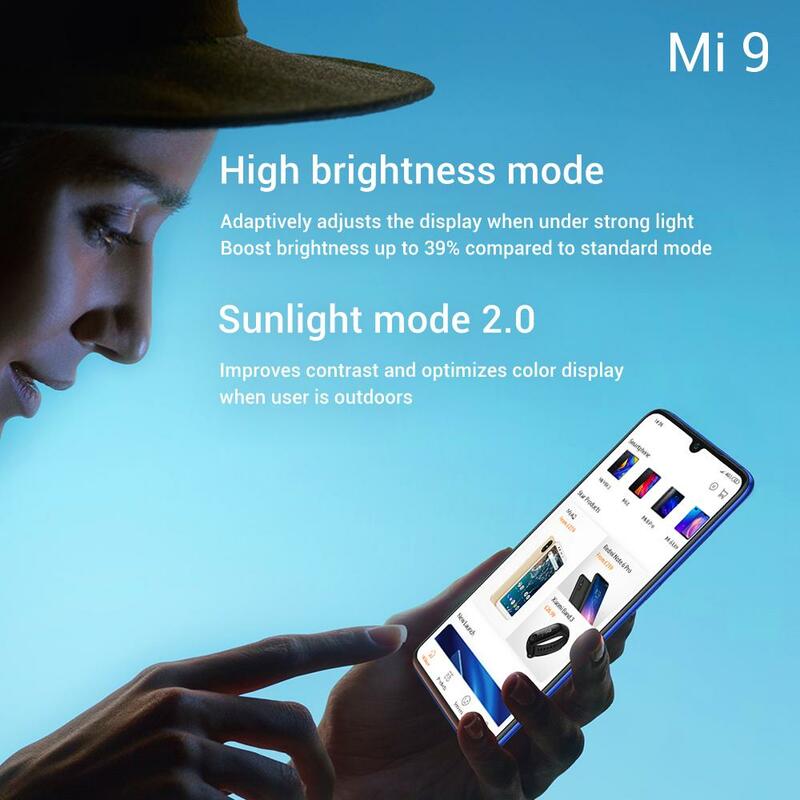 The Xiaomi Mi 9 runs MIUI 10.2-based Android 9 Pie. 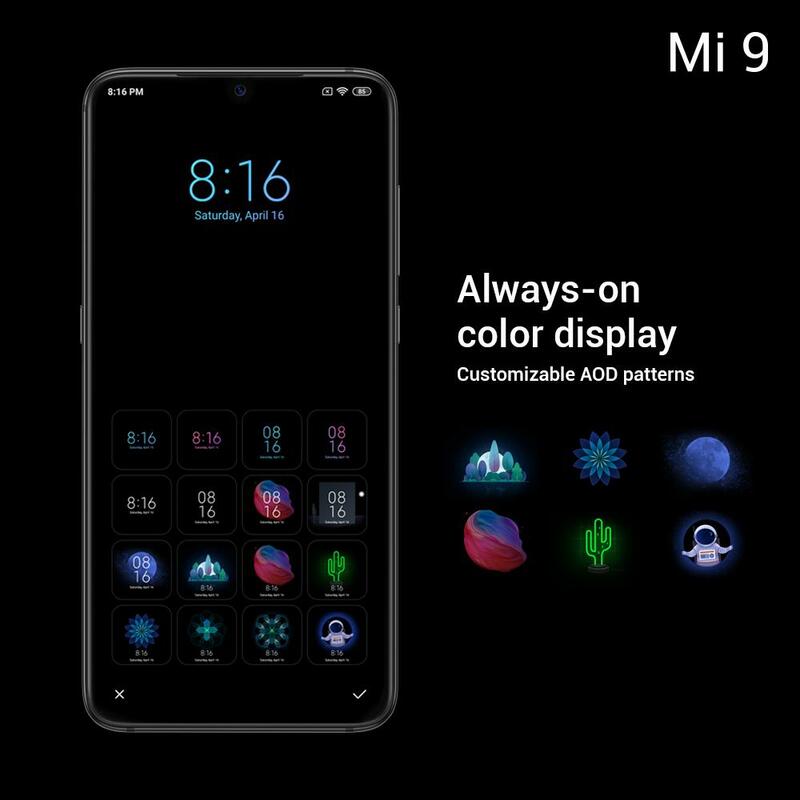 The dark mode that debuted on a recent MIUI 10 beta will be found on the Mi 9. 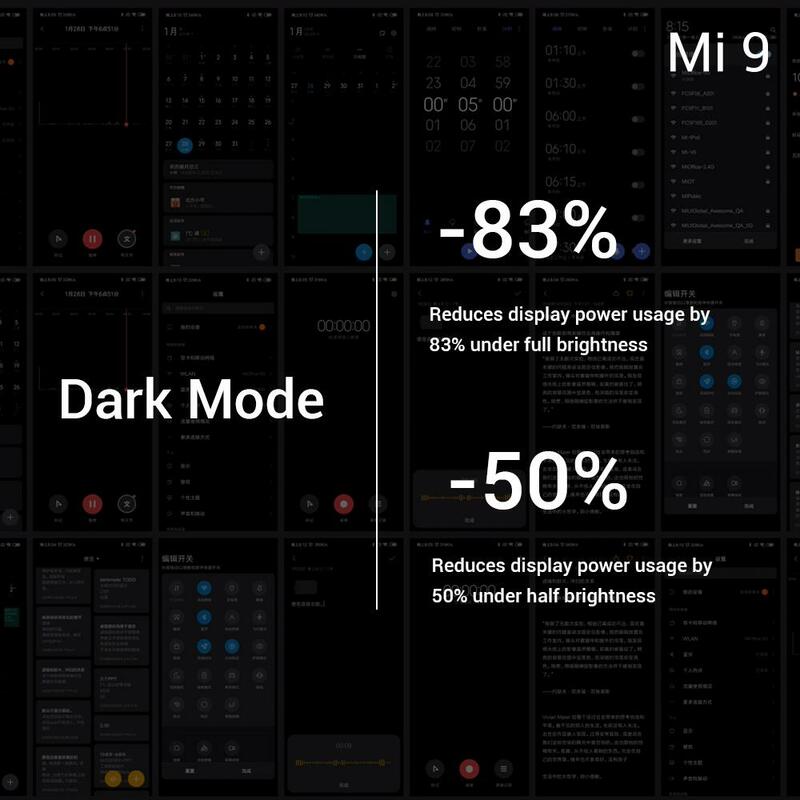 Xiaomi promises huge power savings with the new dark mode thanks to the Mi 9’s OLED display. Since the device has an OLED panel, Xiaomi allows the device to have an always-on display mode. 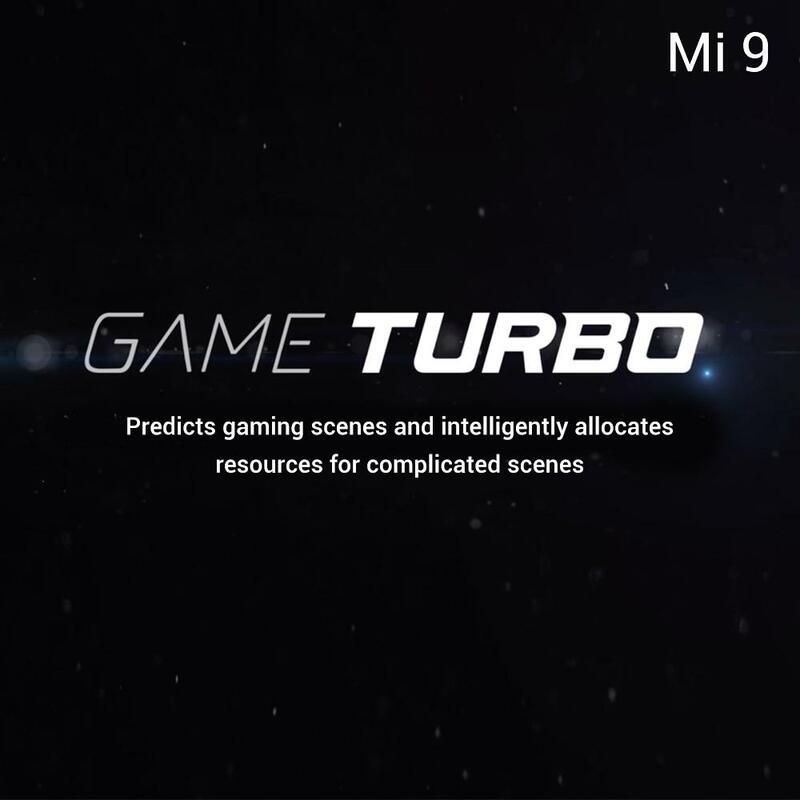 The Mi 9 will also support a Game Turbo mode to improve gaming performance, especially in games like PUBG Mobile, though it’s unclear what Xiaomi has done to optimize performance here. 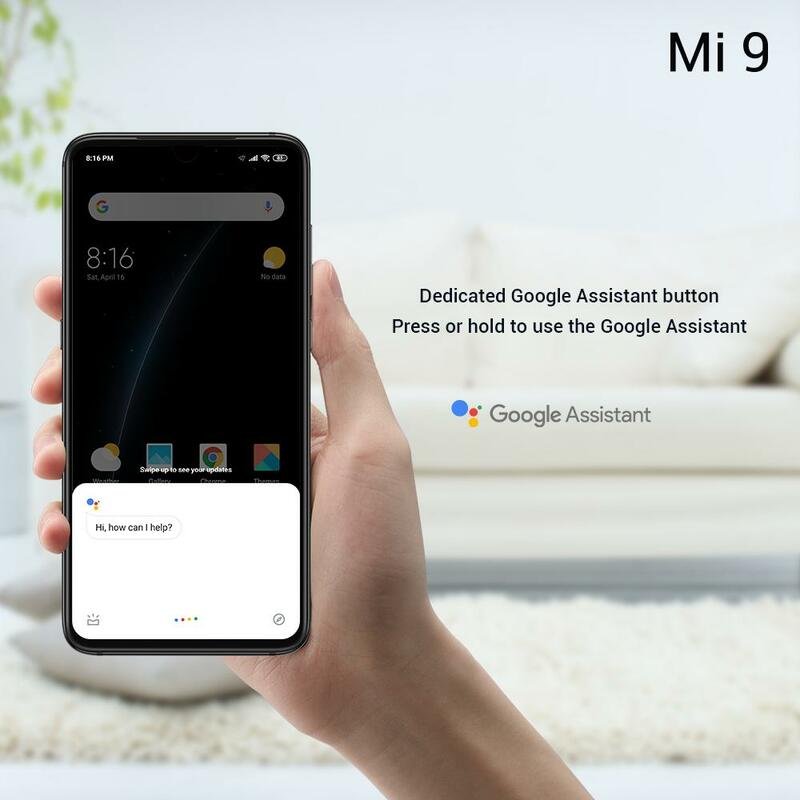 Lastly, the phone has a dedicated button for launching virtual assistants like Google Assistant. Xiaomi has been teasing a collaboration with the movie Alita: Battle Angel, and now they’ve unveiled the fruits of this collaboration: the Mi 9 Transparent Edition. The Transparent Edition has 12GB RAM and 256GB storage, and a slightly improved 48MP primary rear camera sensor with a 7P lens and f/1.47 aperture. 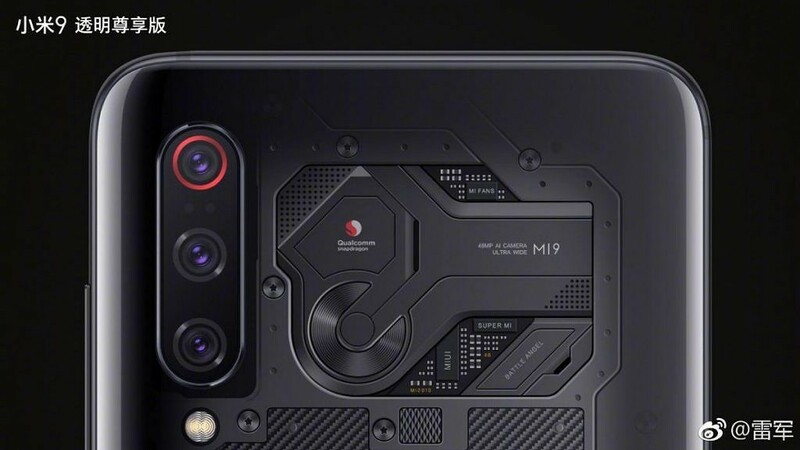 Like the Mi 8 Explorer Edition, the Mi 9 Transparent Edition has an inert PCB shown on the back for illustrative purposes. The gradient glass on this model is 0.4mm thick. 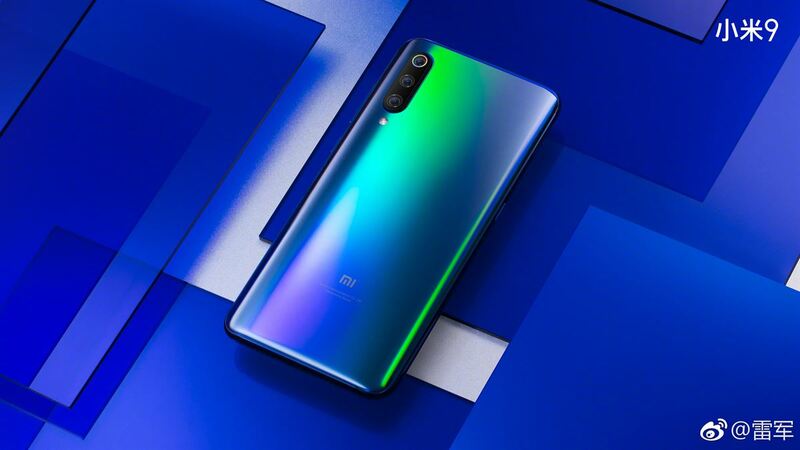 The Xiaomi Mi 9 will be available in China, the UK, and other markets as we’ll find out during Mobile World Congress. 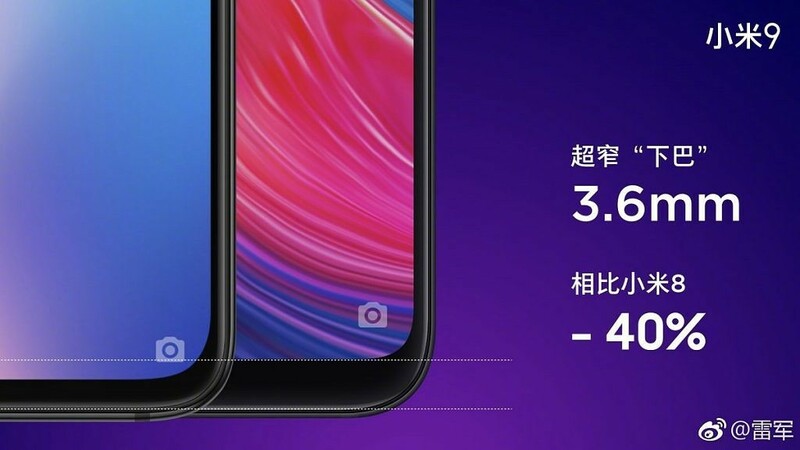 The Xiaomi Mi 9’s pricing starts at 2999 Yuan, or about $446 for the 6GB RAM and 128GB storage model, while the 8GB RAM and 128GB model costs 3299 Yuan, or about $490. The Xiaomi Mi 9 Transparent Edition costs 3999 Yuan, or about $595. 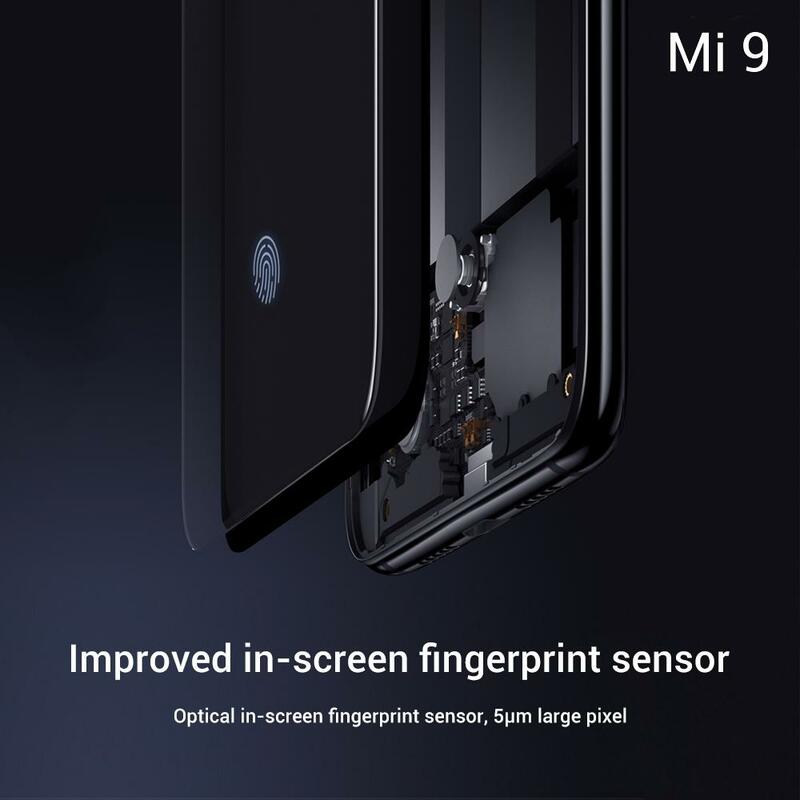 We’ll find out more details about the pricing and availability of the Mi 9 in Europe at MWC, but I’m not sure the Mi 9 Transparent Edition will launch outside of China.